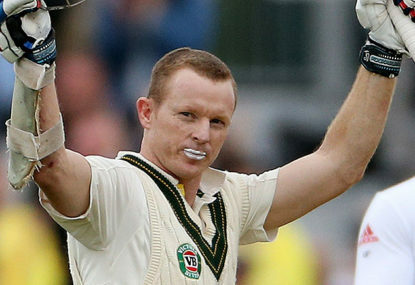 Chris Rogers is a throwback to another era. He is largely a square peg in a world of round holes. Young batsmen nowadays are schooled in clearing the front leg, going big and are expected to display more versatility than a Swiss Army knife. Less than two months from his 38th birthday, you get the feeling that Rogers couldn’t give a flying fig about all these new fandangled methods. For him, the game is what it always has been: a battle of mind over matter; of substance over style, of grinding the life out of an opponent. To hell with the hares, he is happy to graze with the tortoises. And as far as Australia is concerned at present, thank God he is a man who has stayed true to his core values. Throughout his 16-year first-class career he has shown a monastic devotion to compiling runs. Only three Australian batsmen have bettered his 10 first-class double centuries – Don Bradman (37), Bill Ponsford (13) and Justin Langer (11). He has collected first-class runs like a frequent flyer collects miles – over 24,000 in fact. His first 10 years at domestic first-class level were spent at the top of the order on the quick and bouncy pitch at the WACA Ground before moving to Victoria where he batted on the drop-in decks of the MCG. And for much of his first-class career he has also plied his trade in England, turning out for four counties – Derbyshire, Leicestershire, Nottinghamshire and Middlesex. In January 2008 he finally got a Test call-up, replacing an injured Matthew Hayden for the Perth Test against India. Rogers strode to the middle at the age of 31 on the back of 105 first-class matches that had netted nearly 8500 runs at 47.5 and a best of 319 among his 22 centuries. He knew his game and the conditions like the back of his freckled hand but alas neither guaranteed success as he was dismissed for 4 and 15. With Hayden ready to go for the next Test at Adelaide, Rogers was back playing Shield cricket. For quite some time he seemed destined to be one of that group who tasted Test cricket but did so only once. Undeterred, Rogers just kept doing what he does best – score runs. And lo and behold, opportunity came knocking at his door 65 months after his one-off debut match when he was selected for the 2013 Ashes series. An innings of 84 in his third Test back at Manchester was followed next start with a maiden century at Chester-le-Street. And, from then on, he has been a fixture at the top of the order, save for a medical time out during the recent two-Test series in the Caribbean. Left feeling like an un-tuned television when struck by a net bowler days out from the first Test at Rousseau, he was ruled out of the entire series as a result of severe concussion. But Rogers is not a man to give up and he was soon compiling runs in the lead-up matches ahead of the opening Test. In the first innings at Cardiff where others got starts yet fell around him he soldiered to 95 before perishing. Lord’s would produce no such letdown as he strode to a 72nd first-class century that took his first-class average north of 50. After losing his partner Warner (38) with the score on 78 he was joined by Steve Smith with the pair silencing the heartiest of English fans and reminding them that this Ashes campaign was by no means a foregone conclusion. At stumps Rogers was unconquered on 158 and Smith a commanding 129 not out in a faith restoring total of 1-337. The pair added an unbeaten Australian second wicket record at Lord’s of 259 runs. For Rogers, it was a triumphant knock, the highest of his five century, 22-Test career. In the first innings of both Tests this series he has employed all his experience in English conditions. Indeed, his technique is quintessentially suited to the Old Dart. With a seemingly non-existent backlift and the ability to play the ball late he removes much of the threat that can be posed by efficient and probing swing bowling. While so many modern-day players go hard at the ball – often at their peril – Rogers waits and watches. He announced on the eve of this series that it would be his last. No doubt that admission further galvanised his resolve. His has been a career that has embodied the Corinthian spirit of good sportsmanship and gallantry. And on the opening day at Lord’s he again proved that the flame often burns brightest just before it goes out. And, as far as England is concerned, they will be hoping to douse it throughout the remainder of the series before it can flicker bright again. And if they cannot turn down the wick early on Day 2 at Lord’s an 11th first-class double century may well be on the way for Christopher John Llewellyn Rogers.